Utilizing decades of knowledge and experience in "saddle seat" has enabled us to craft the ultimate in cut back show saddles. Our unique spring tree is constructed with 5 position stainless steel adjustable stirrup bars, the tree has been redesigned with a wider profile and upholstered with pure natural latex to give the rider a seat of unparalleled comfort. The sculptured narrower twist gives a sensitivity and feel that no other saddle on the market today comes close to. We then finish the seat in the most luxurious super grip water buffalo hide available in the world today, this affords the rider a seat of exceptional security and balance that can only enhance performance and has to be truly experienced to be believed. The outer flaps are cut from the finest quality water buffalo hides tanned in England exclusively for us. This gives the most comfortable, secure and luxurious feel of any saddle on the market today with absolutely no breaking in need whatsoever. Traditional close contact pure wool felt panels with an impact absorbing gel sandwich, hand stitched and covered with supple English calf skin give a new meaning to the term horse friendly. 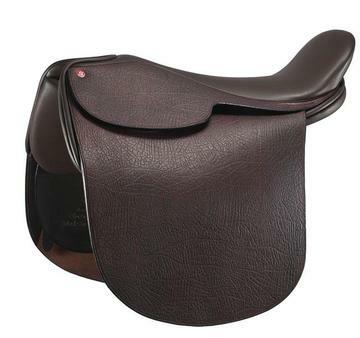 Without doubt this is the most comfortable cut back saddle on the market for both horse and rider anywhere in the world today. The finish and build quality can only be described in one phrase "How saddles used to be made", truly the pinnacle of the saddle makers art and the Rolls Royce of cut back saddles. Sold less fittings. Available in Flat or Deep Seat. Sizes; 21" or 22". Colors: Black or Havana Brown. Requires $41.95 additional shipping and handling. Flat seat available by special order. Please allow 6-8 weeks for delivery.